We are happy parents of two wonderful little kids. 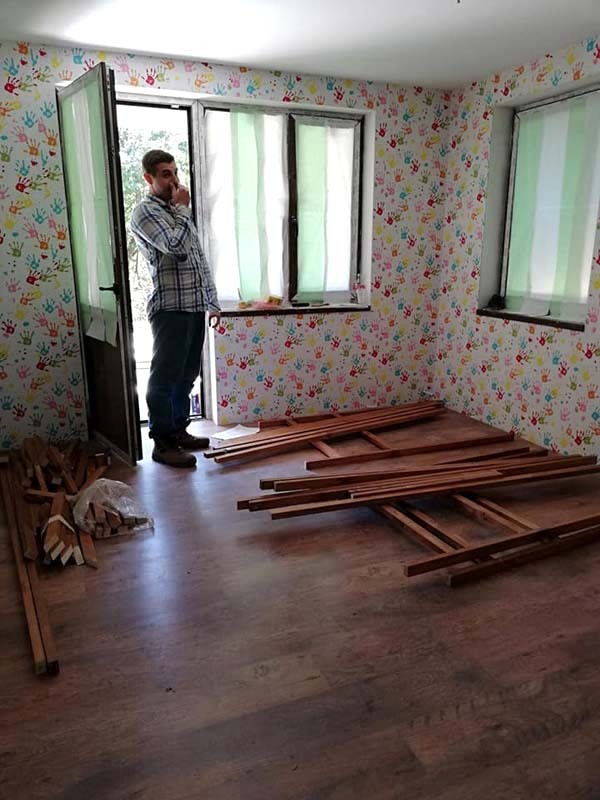 Unfortunately, they are growing so fast and the time when they need to have their own room so we have recently started planning on the furniture. My wife and I believe that the kids’ bedroom is their fortress, their playground, their private spot. So, the room should express their style and personal taste. For the color of the walls in the kids’ bedroom, I and my wife have decided to ask the kids what color palette do they like. The wall design is entirely their decision (you can see how creative they could be 😉 ). I think it is very cool! Perhaps the bed is the key element of their room and calls for unlimited comfort plus functionality. 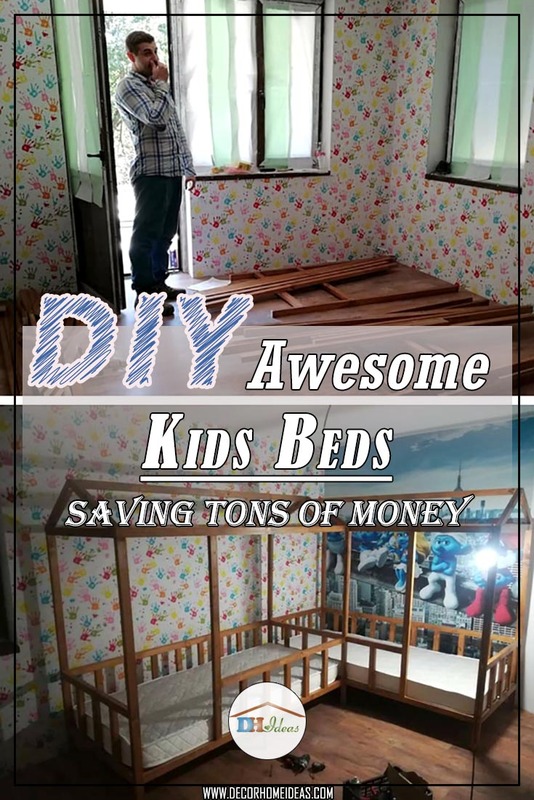 DIY toddler bed seems like a hard project to do, but if you are determined to create something with your own hands, you can make it. 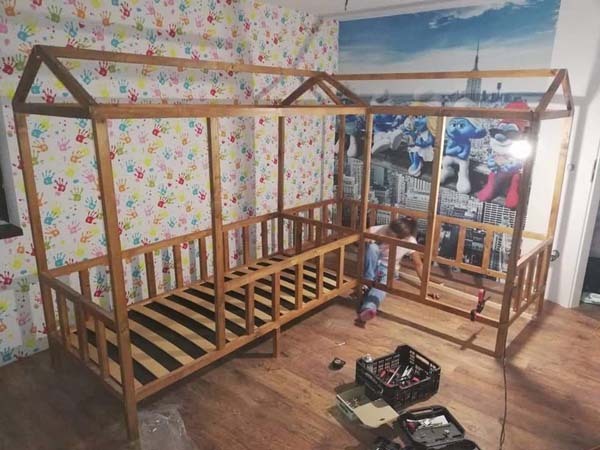 Instead of buying a very expensive traditional bed from IKEA, we have decided to build something adorable which will save us lots of money. For these lovely twin beds, we took a few ideas from the web. Then we developed those ideas and made them our own. In fact, there are so many possibilities to customize the beds to suit exactly what your kids find comfy, cozy, and cool! 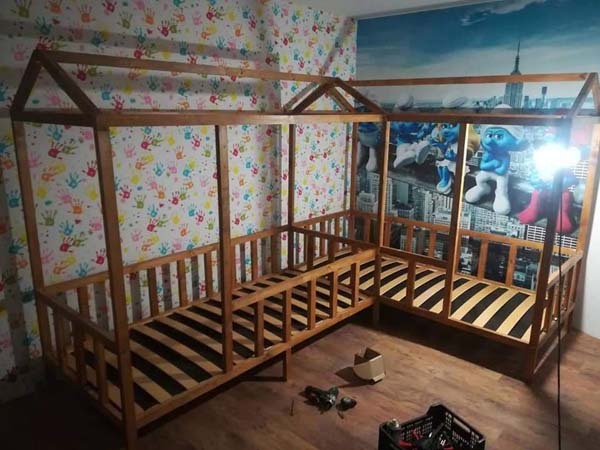 We’ve chosen the materials, mainly dry beams 3,5 / 4,5 cm аnd bought them from a popular timber company. 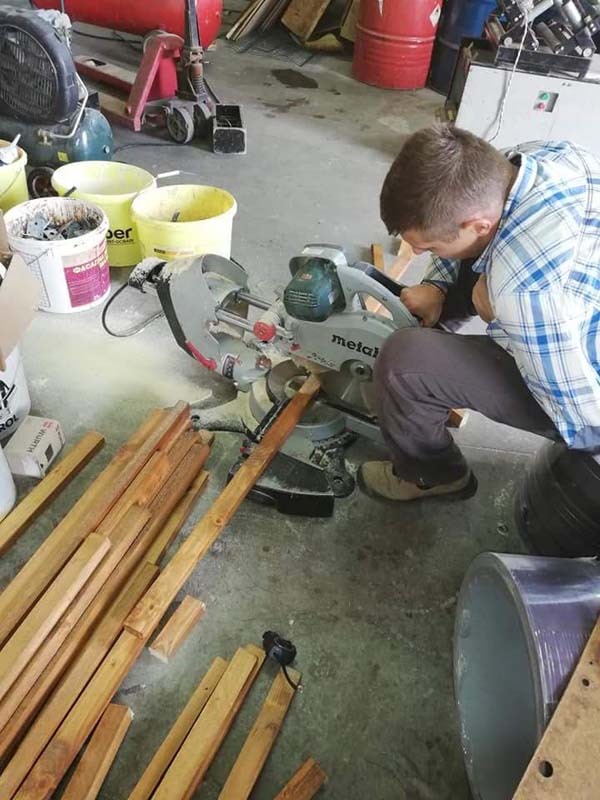 We processed the material with a smear (with UV protection, wood protection, and color), then varnished the wood, and finally trimmed it using a hand saw. The necessary tools for the assembling are a screwdriver, drill 3 mm, wood screws 4×60 mm, 5×80 mm, clamps, colored yarn for decoration. As you can see, my wife is a big fan of the DIY projects as well so she was helping me a lot. 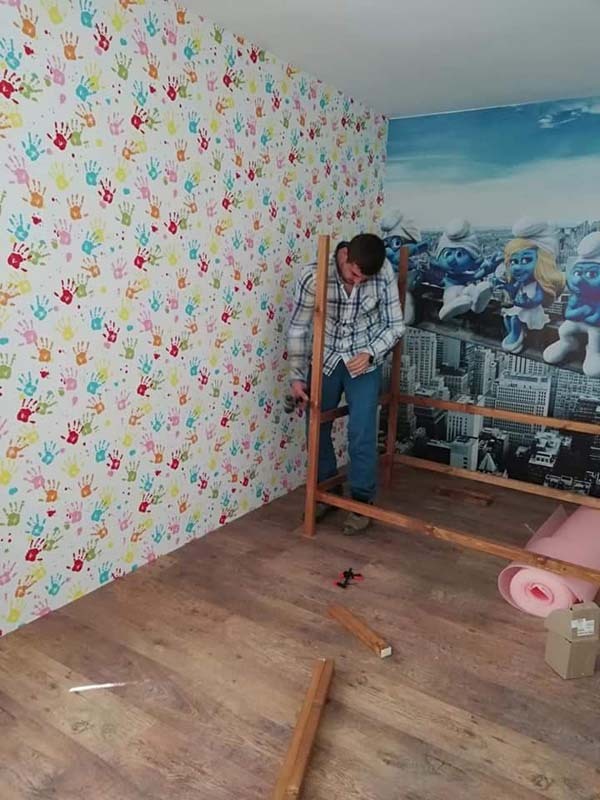 Don’t forget that when you execute a DIY project for your kids, their safety should be your priority. The assemblies have been fixed with angular and simple claws, then with the drill, and then screw the screws (so that the wood does not burst). 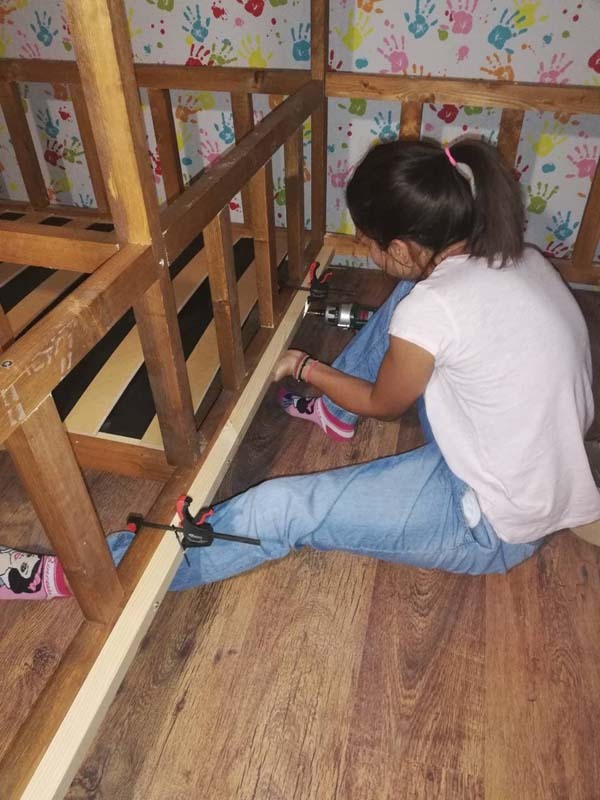 We mounted an additional 2/3 girdle interior fitting to lay the mattress frames (pre-purchased). 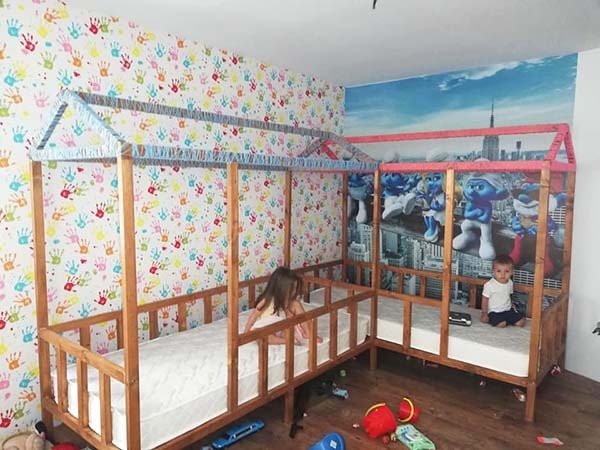 We used double-sided mattresses with dimensions 80/180. On the feet, we put extra pads so that the floor cover is not gouged. The roof was decorated with a colorful yarn, roughly coiled, suitable for a girl and a boy. 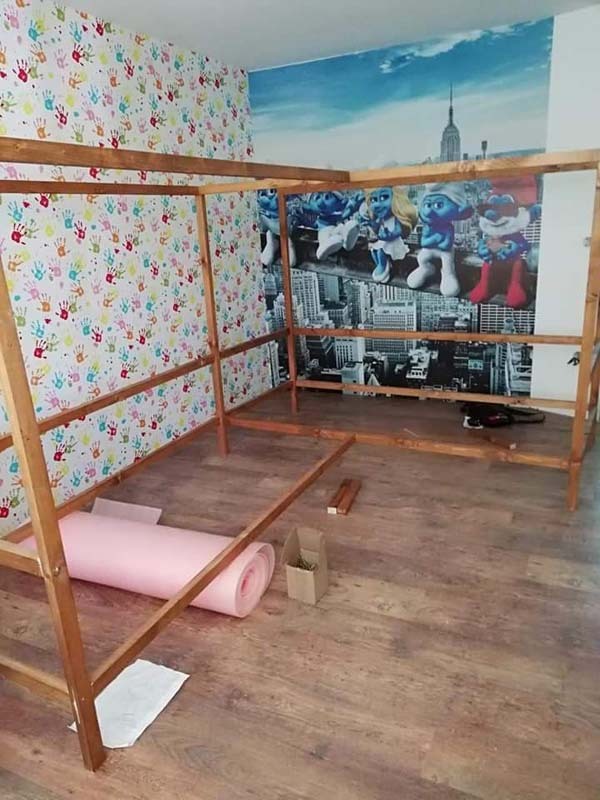 A week after we finished the kids’ bedroom, I decided to post some pictures on my Facebook profile so many parents can see that you don’t have to necessarily spend a fortune on expensive furniture.